Updated Tuesday Oct. 16, 5:05 p.m. The latest numbers from PG&E have 6,254 customers still without power. The county breakdown is as follows:1,600 in Amador County, 2,000 in Calaveras County, 2,500 in El Dorado County, 34 in Lake County and 120 in Napa County. Check back for updated numbers in the morning. Updated Tuesday Oct. 16, 4:15 p.m.
Pacific Gas & Electric says 10,385 customers as of Tuesday afternoon remain without power in the North Bay and Sierra foothills after the company pre-emptively shut off power Sunday to more than 59,000 customers to prevent wildfires. PG&E says it is working to return power to all customers Tuesday, but did not give an exact time. PG&E spokeswoman Tamar Sarkissian said there may be exceptions in some areas where crews found damage from recent weather events. Strong winds and dry conditions prompted PG&E, for the first time, to turn off electricity on Sunday to some of its customers in a bid to prevent wildfires. Outages still affect 10,385 customers in several counties: 377 in Napa County, 206 in Lake County, 5,015 in El Dorado County, 2,112 in Calaveras County and 2,675 in Amador County. Most schools that closed Monday due to the power outages were re-opened Tuesday, with the following exceptions: Cobb Elementary School in Lake County and Pope Valley Elementary School in Napa County. Original Post Monday, Oct. 15, 1:40 p.m.
Strong winds and dry conditions prompted Pacific Gas & Electric, for the first time, to turn off electricity to some of its customers in a bid to prevent wildfires. PG&E said it shut off power for some 59,000 customers in seven California counties in the North Bay and Sierra foothills on Sunday. More than 17,000 customers in Sonoma, Lake and Napa counties and 42,000 customers in Amador, Calaveras, El Dorado and Placer counties, were affected by the proactive outages, the utility said. PG&E said it's monitoring conditions in Butte, Sierra, Placer, Nevada, Plumas and Yuba counties and could turn off power in those communities, too. Strong wind gusts overnight — especially at higher elevations — swept through the North Bay, said meteorologist Roger Gass of the National Weather Service. Wind speeds reached 77 mph at Middletown and near Mount Saint Helena, Gass said. Other reports said winds reached 60 to 65 mph, the agency said. "Most of the north state is under a red flag warning," said Cal Fire Deputy Chief Scott McLean. "Our fuel is so receptive to fire right now. It just takes one spark." Some small wildfires broke out in Shasta County over the weekend, McLean noted. Firefighters also rushed to put out a small blaze in Butte County, he said. The winds have begun to slow and will continue to weaken throughout Monday, Gass said. "The fire threat has diminished," Gass said. He noted, though, that "the critically dry conditions will prevail today and we don't want to completely let down our guard." While the threat has lessened, PG&E wasn't expected to restore electricity to the affected customers until Monday night or Tuesday morning, said utility spokeswoman Melissa Subbotin. The power won't be turned back on until PG&E's weather experts conclude that conditions have improved and its crews have inspected the utility's infrastructure and determined it is safe to reactivate, Subbotin said. "Restoration timing will depend on weather conditions and any repairs needed to PG&E's electrical equipment," PG&E said in a statement. 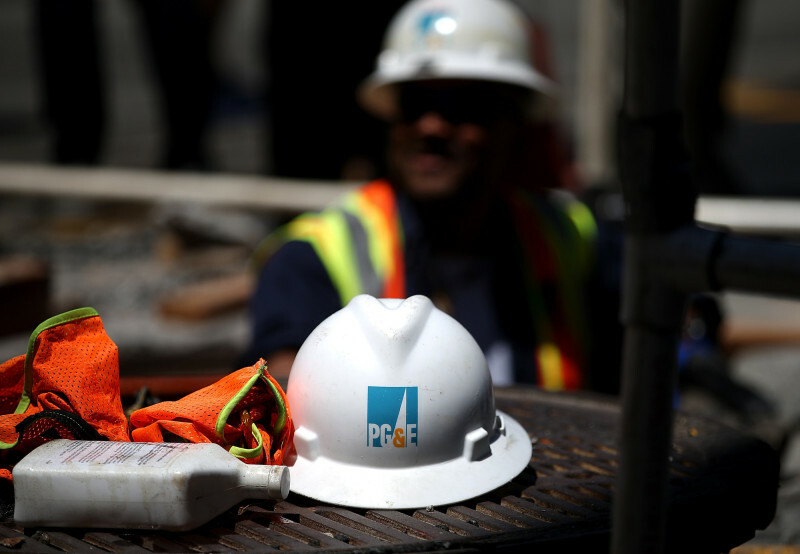 The company said that as of 8 a.m. Monday, those conditions have improved and PG&E had begun inspections of its lines for "any necessary repairs by helicopter, in vehicles and on foot." PG&E says it anticipates its crews will complete inspections by the end of the day. The utility announced Sunday night that it had "proactively turned off the power in extreme fire risk areas" of the North Bay. That included unincorporated northeastern parts of Sonoma County as well as Angwin, Calistoga, Deer Park, Lake Berryessa, Napa, Pope Valley and Saint Helena in Napa County. The outages prompted the closure of dozens of schools, canceling classes for more than 9,000 students. In Napa County, the Calistoga Joint Unified School District, Pope Valley Elementary School and Howell Mountain Elementary School canceled classes on Monday, according to Napa County Office of Education spokeswoman Seana Wagner. Those schools were expected to re-open on Tuesday, Wagner said. In Lake County, the power shut-offs affected Clearlake, Clearlake Oaks, Clearlake Park, Cobb, Finley, Hidden Valley Lake, Kelseyville, Lakeport, Lower Lake and Middletown. In that county, classes were canceled at the Kelseyville, Konocti, Lakeport and Middletown school districts. Two schools run by the county, the Lloyd P. Hance Community School and the Clearlake Creativity School, were also closed Monday, according to Jill Ruzicka, spokeswoman for the Lake County Office of Education. In Sonoma County, the utility took away electricity from remote and rural portions of the rugged hillside areas east of Healdsburg and Geyserville, according to Christopher Godley, the county's interim emergency services manager. No schools were canceled in Sonoma County, Godley said. PG&E's decision to shut off the power came close to a year after fires devastated parts of Northern California. In June, Cal Fire announced that PG&E's electrical infrastructure caused at least a dozen wildfires in six Northern California counties. That same month the utility announced a new plan to cut off power during times of extreme fire hazard. "I wish they had done it, frankly, last year," said state Sen. Bill Dodd (D-Napa), who represents parts of the North Bay devastated by the October fire siege. "While it is an inconvenience it's much better than sparking a runaway wildfire," Dodd said. The National Weather Service's Gass said the most recent wind conditions were similar to weather patterns involved in the 2017 blazes. But this time around the elevated wind speeds stayed at higher elevations. "They did not mix down into the valleys like they did across Santa Rosa a year ago," Gass said. The practice of shutting off power to reduce fire risk is not new in California. Since 2013, San Diego Gas and Electric has preemptively shut the power off at least 16 times. It's too early to tell if PG&E's move actually prevented wildfire activity, said Cal Fire's McClean. "This a decision made strictly by PG&E," McLean said.